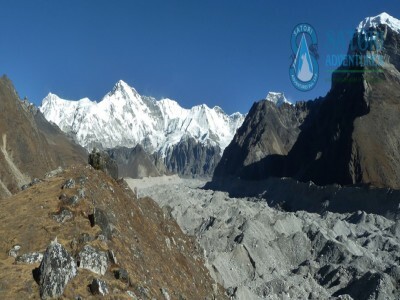 The Everest Renjo La Pass Trek is one of the most exhilarating trekking routes for those who love to trek the high passes. 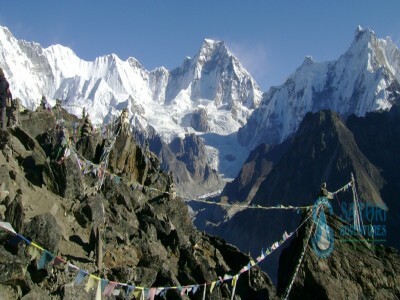 The trek leads to the Renjo La, on the way to Tibet Boarder Nagpa La (5,710m) and Gokyo Valley. 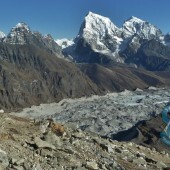 This Everest Renjo La Pass Trek is an easy hiking trail in Everest region compared to other Passes such as Congmala and Gokyo Cho La Pass Trek. 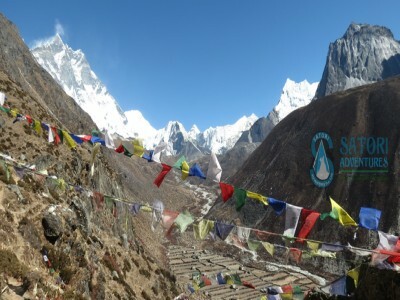 The Everest Khumbu Renjo La Trek is situated between Thame, a village on the way to Tibet boarder Nagpa La Pass and Gokyo valley, a valley rich in blue lakes and glaciers. The Trek starts after a 35-minute exciting flight from Kathmandu to Lukla. 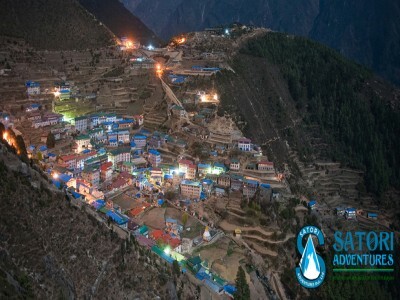 On the way from Namche to Thame, we will explore Sherpa life style. We will also come across Tibetan Nomads with their loaded Yak Caravan. 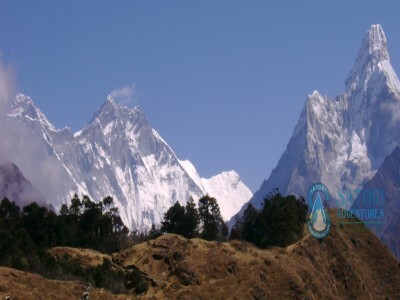 You will then walk to the Everest View Lodge from where you can watch the panorama of mountains such as Mount Everest (8848m), Mount Amadablam (6812m), Island Peak and many other peaks from a close range. We will then start crossing the Renjo La, having an adventurous experience. Satori Adventures offers you a 22-day Itinerary. Yet, as per your request we can change your Itinerary keeping your interest and desire in mind. 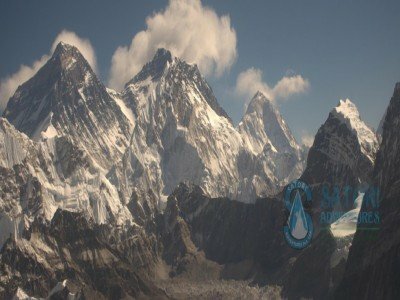 Since this Trekking is a little bit challenging, we have to arrange some trekking equipment like down jackets, down sleeping bags, trekking sticks, ropes, trekking boots, etc. You can trek through this trail all over the year though, the best time is March-May and August-December. 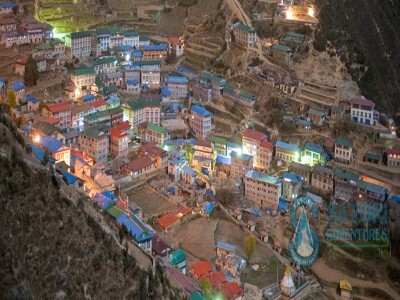 Day 04: Acclimatization Day, Hike to Everest view hotel (3800m/12468ft) for sunrise or panoramic view of Everest Lhotse face, after lunch explore Sherpa and Hilary museum at modern village of Namche. Day 05: Trek from Namche Bazaar to Tyangboche (3860m/12665ft, 05hrs) lodge accommodation. Day 06: Trek from Tyangboche to Dingboche (4250m/13943ft, 5hrs) lodge accommodation. Day 07: Acclimatization Day at Dingbotche, Hike to chhukung (4750m/15584ft.) for better acclimatization before climbing up to Kalapatther and Everest base camp. Day 08: Trek from Dingboche to Chhukung(4730m/15516ft, 04hrs) lodge accommodation. Day 09: Trek from Chhukung to Khangmala BC (5000m/16401ft, 04hrs) lodge accommodation. 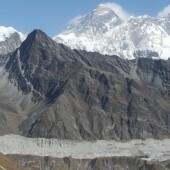 Day 10: Trek from Khangmala BC to Khangmala pass (5535m/18156ft, 06hrs) via Lobuche (4930m) lodge accommodation. Day 11: Trek from Lobuche to Everest base Camp (5200m/17057ft, 05hrs) and to Gorekshep (5170m/16959ft, 04hrs) lodge accommodation. Day 12: Trek from Gorekshep to Dzongla (4860m/15942ft, 05hrs) lodge accommodation. Day 13: Trek from Dzongal to Chola pass (5368m/17609ft) trek to Dragnag(4700m/15417ft, 06hrs) lodge accommodation. 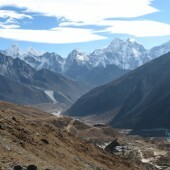 Day 14: Trek from Dragnag to Gokyo(4790m/15713ft,05hrs) lodge accommodation. 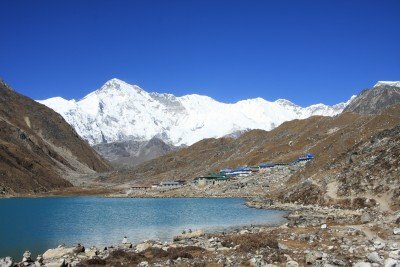 Day 15: Acclimatization Day at Gokyo (Explore around Gokyo Ri (5357m/17572ft) lodge accommodation. Day 16: Trek from Gokyo to Renjo La passes (5360m/17582ft) then back to Lungdhen (4380m/14368ft, 07hrs) lodge accommodation. Day 17: Trek from Lungdhen to Taranga (3950m/12957ft, 04hrs) lodge accommodation. 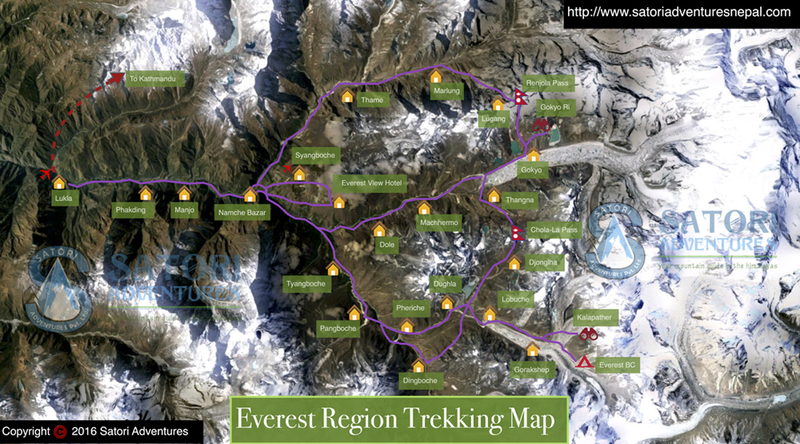 Day 18: Trek from Taranga to Thame(3800m/12465ft, 05hrs) lodge accommodation. Day 19: Trek from Thame to Monjo(2835m/9300ft, 06hrs) lodge accommodation. 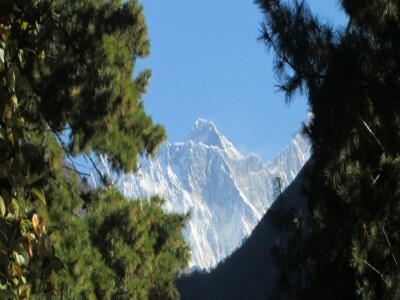 Day 20: Trek from Monjo to Lukla, (2840m/9316ft, 05hrs) lodge accommodation. Day 21: Fly from Lukla to Kathmandu (1350m/4430ft) Transfer to Hotel. Day 22: Free day at Kathmandu for shopping and explore around Thamel, farewell dinner with culture program In the Evening. Day 23: Drop to airport for final departure, or Join alternative activities.